An apple, jostled loose from the branches of a tree by a hungry man, rolls down a hillside into a small creek. Bobbing along in the gently running current, the gurgling of the stream blends aurally with the voices of two tired men arguing over a search gone wrong, lost in the wilderness. It finally settles, floating but inert, among some rocks in the shallows, in the company of others fellow apples that have suffered the same fate, rotting away in immobility in the midst of the moving stream. Turkish filmmaker Nuri Bilge Ceylan’s Once Upon a Time in Anatolia obliquely references Sergio Leone’s spaghetti western classic with its title, but has more to do with that seminal film’s deconstructed frontier morality than its whipcracking stylized brutality. 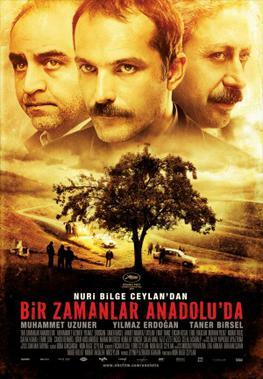 There is something of the western to its setting and general plot, as a group of Turkish officials (police, military, a prosecutor, a doctor) conduct a night-to-day search for the body of a murdered man at the unreliable direction of the prime suspect in his killing. But with its long contemplative takes and existential asides, it resembles few westerns and more arthouse exercises (although something like The Assassination of Jesse James by the Coward Robert Ford is a good example of another cinematic location where those forking paths met). Once Upon a Time in Anatolia is based on the true-life experiences of one of the screenwriters, as well as upon the small-town memories of Ceylan himself. It’s constructed as a series of static, haunting images that are much more memorable and enduring in the film’s nocturnal first half than as grey daylight creeps in during the later stages. But then, I might suggest, this is exactly the point. The men travel from one prospective body burial site to another in two cars and an army jeep, getting out to stumble over fields in the vain hope that the laconic, guilt-ridden suspect might recall some details about where the body was hidden. In the blackness, nothing is certain; ancient fountains and bridges are unreliable landmarks, one slope of the steppes looks rather like the next. Truth is obscure, certainty lost in dim possibility. The doctor, ostensibly the thoughtful and sympathetic protagonist, glimpses an ancient face carven out of rock in a flash of lightning. Far away, he is sure it is raining, and quotes a poet concerning the endlessness of time and mortal man’s transitory role in its passage (quotations from Anton Chekhov plays also litter the dialogue). Trees and their discarded leaves sway and scatter in the moonlit winds as the prosecutor tells him about a woman who predicted the moment of her own death. Something so horribly material as a dead body will never be located in this atmosphere of deep mystery and mystic, prophetic ephemerality. Defeated at last by the unknowable night, the searchers take a meal and rest are taken in a small village whose voluble mayor presses the prosecutor to put in a word for funding to improve their graveyard. No other structure in the dying town is worth investing in; like the men who visit him for a respite, making sense of death is the only issue of interest to this mayor. As the darkness finally begins to retreats, a woman finally appears in this grim company of men: the mayor’s beautiful daughter, serving them coffee, her face seeming to float suspended in a halo of light from the lamp she carries on the beverage tray. This glow transitions to day, and in the sickly morning the corpse is found quickly. It’s a tableau of macabre realism emphasized by the starkness of the wavering, washed-out daylight, a scene inconceivable in the ineffability of the night before. The film works towards the quasi-official conclusion of an autopsy room, through barren hallways and tiled rooftops with birds wheeling above them. But even the supposed clear-cut rationality of a medical examination cannot coalesce into a hardened episteme of truth. Institutional authority is gradually drained of its life-maintaining fluids. The doctor, his keen glance a proxy for our collective human consciousness of the terrors we stand always at the precipice of while clinging to what we feel to be true, fails to face up to those terrors in the end. He crafts a different, less disturbing truth, just as the prosecutor does in his story of the woman who knew when she was to die (and may have been much closer to him than a mere victim in a case). In the cold light of day, Once Upon a Time in Anatolia overlays what crouched in the darkness with a dull manufactured truth. All to escape that unsettling symbolic image of an apple stalled in the ever-flowing stream of time.